Mold remediation is the procedure used by professional mold companies to eradicate mold from an indoor environment. There are several different processes available. However, only a couple have proven scientifically effective at eliminting mold from an indoor environment and preventing its return. 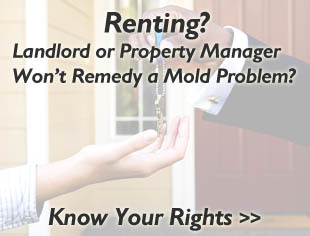 Everyday Contractor – Many people make the mistake of hiring a regular contractor to clean or rip-out mold. Mold can be a serious airborne contaminant like lead and asbestos. There is a reason why laws require special procedures when performing abatement for these contaminants. When you disturb their environment you turn what might only be a surface-based contaminant into an airborne one. Once airborne, it can impact the health of occupants throughout the entire property as it spreads into multiple environments (this is known as cross-contamination). 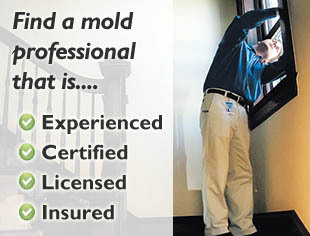 Only a professional mold remediation technician who follows industry standards should be sought to remove mold. Fogging – The process of using specialized equipment and Concrobium to produce a chemical fog to eradicate mold should be avoided. Organizations from the Environmental Protection Agency (EPA) to Indoor Air Quality (IAQ) organizations such as the National Association of Certified Home Inspectors (NACHI) advise against this method as it only has a chance of killing mold spores that are exposed to the environment. In addition, it does not remove the mold spores that have contaminated the environment. Bleach – A Chlorox or bleach solution is seen by most as the strongest cleaning chemical. While bleach and other household cleaning chemicals are touted for their cleaning abilities in commercials, they are not an effective solution to an indoor mold contamination. In many situations, bleach won’t even kill all of the mold spores in which it contacts. If a mold or cleaning company claims that the use of bleach will take care of a mold problem they are inexperienced, uncertified and will, more likely than not, leave you with a bigger problem in the long term. Ozone – The use of an ozone machine as a means of eliminating a mold problem is another ineffective and incomplete method. Similar to fogging in that it uses airborne “treatment” as a means of remediation, this process uses an ozone generating machine to try and eradicate mold. This method does not completely kill mold, especially mold beyond the surface, and it does not remove the mold spores that are contaminating the air and surface environments. Ozone treatments are also strongly discouraged by the EPA. Find a Company That Performs EPA-Approved Mold Remediation: If you have decided that you would like to seek out a mold company to provide you with information about remediation, click here to find a certified company in your area. how health safe is a house which was inhabited by a hoarder? the house is now being renovated before moving in by family with a newborn. the home was not inspected for possible molds or bacteria. will the newborn be health safe??? How do you think using heat to kill mold in basement? Can it solve the mold/spores problem completely? If not, why? So what does Chlorox Do ?